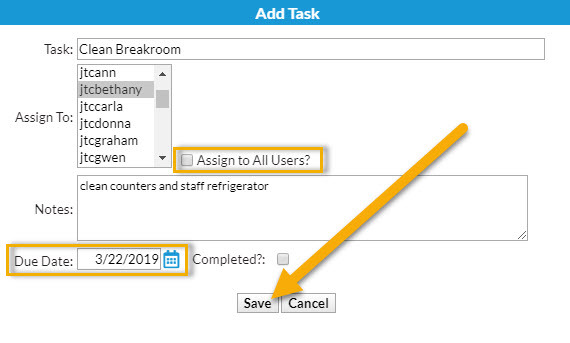 The Tasks section of the Executive Dashboard may be used to assign Tasks to any staff member who has a Jackrabbit User ID. Tasks may be assigned to specific users or to all users. Only the tasks assigned to the User currently logged into the database will display. Click the Add link to add a task. After they have been added, assign tasks in the pop-up window. Enter the name of the Task. Check Assign to All Users? to quickly assign a task to all Jackrabbit User IDs or select a specific user by highlighting the User ID. Add Notes and a Due Date if needed. Be sure to click the Save button. Assigning a task to all users is best used when each staff member needs to complete the task. When one user marks the task complete, it will still show for other users until they mark it complete. If one person is in charge of the task, it is best to assign the task to that person only. Click the links in the Tasks window to view Completed tasks, tasks Assigned to Others, etc.